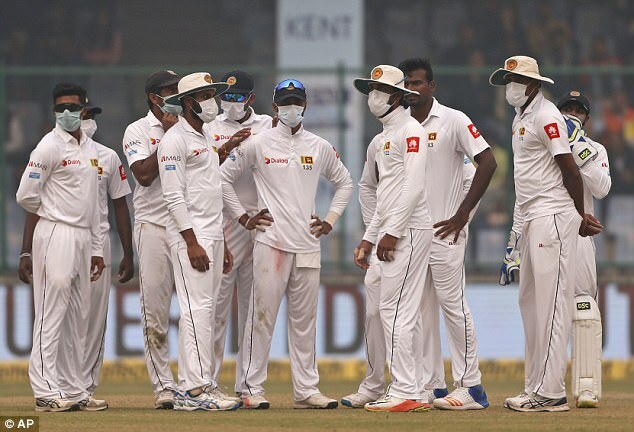 An international cricket test match between India and Sri Lanka in New Delhi was repeatedly halted to allow the players time to vomit due to the incredible thick smog which has engulfed the city recently. The players actually wore facemasks while playing as air pollution at the Feroz Shah Kotla Ground was 18 times higher than the safe level. Several players had to leave the pitch due to breathing difficulties with the match repeatedly halted to allow the players time to vomit. The match was stopped for 20 minutes as the umpires and the medical teams talked. It was the first time a Test match has been stopped due to a toxic smog, but astonishingly the game was not abandoned. Earthwindmap showing incredible build-ups of dangerous PM2.5 particles in Northern India in November. 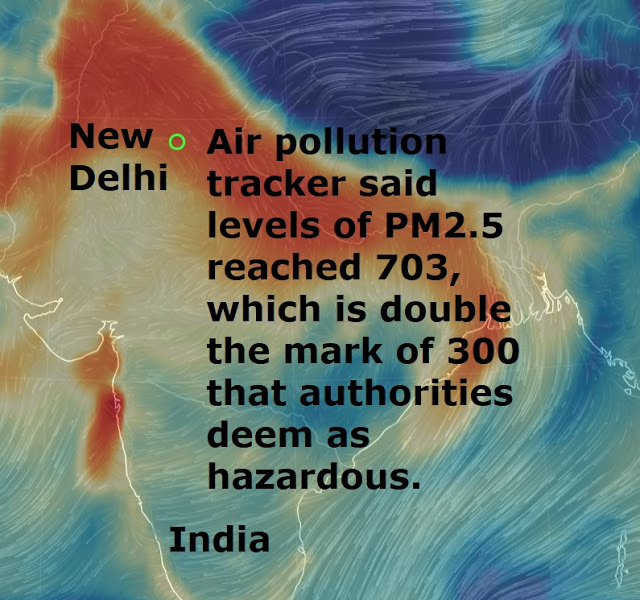 The Indian capital has been enveloped by a shroud of toxic smog since October forcing the Indian Medical Association to declare a public health emergency and advised schools to be shut. In November, the US embassy air pollution tracker said levels of PM2.5, a tiny particulate matter that enters deep into the lungs and bloodstream, reached 703, which is double the mark of 300 that authorities deem as hazardous. Arvind Kejriwal, the chief minister of Delhi, was quick to comment on the worsening pollution situation in the capital, "Delhi has become a gas chamber," he tweeted.